In honor of Easter and the abundance of Easter-themed candy inhabiting my kitchen, I decided to get a little creative! Hence, the following "food experiments". Feel free to try these on your own and report back on your findings! This experiment was inspired by a recent YouTube video I saw from The Food Surgeon. Figure 1 below visually documents each step of the experiment. b. 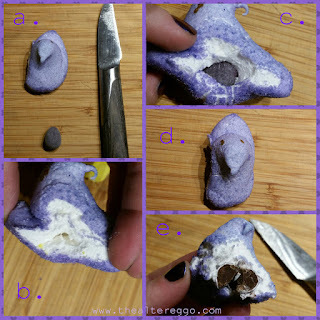 Make a small incision into the side of the Peep to create a cavity for the Mini Egg. c. Jam that Mini Egg into the cavity! d. Admire your seemingly normal looking Peep. 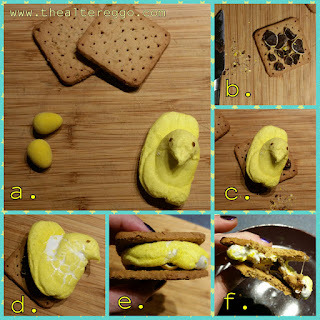 e. Take a bite and witness the glory of a Peep stuffed with a Mini Egg! Experiment notes: Peep was delicious, and texture was pleasurable. It was a bit difficult to make the cavity as the marshmallow is sticky. The Mini Egg was still a bit visible from the side, so it wasn't a perfect "stuffing"; this could be related to previously mentioned difficulty in cavity creation. Final Thoughts: Surgery was a rousing success! Would eat again. After performing surgery, I still had a surplus of Peeps and Mini Eggs. I also happened to have some graham crackers in my pantry. (I keep them on hand in the winter to dip in hot chocolate.) The obvious logic leap lead me to thinking, these are ingredients for S'mores! 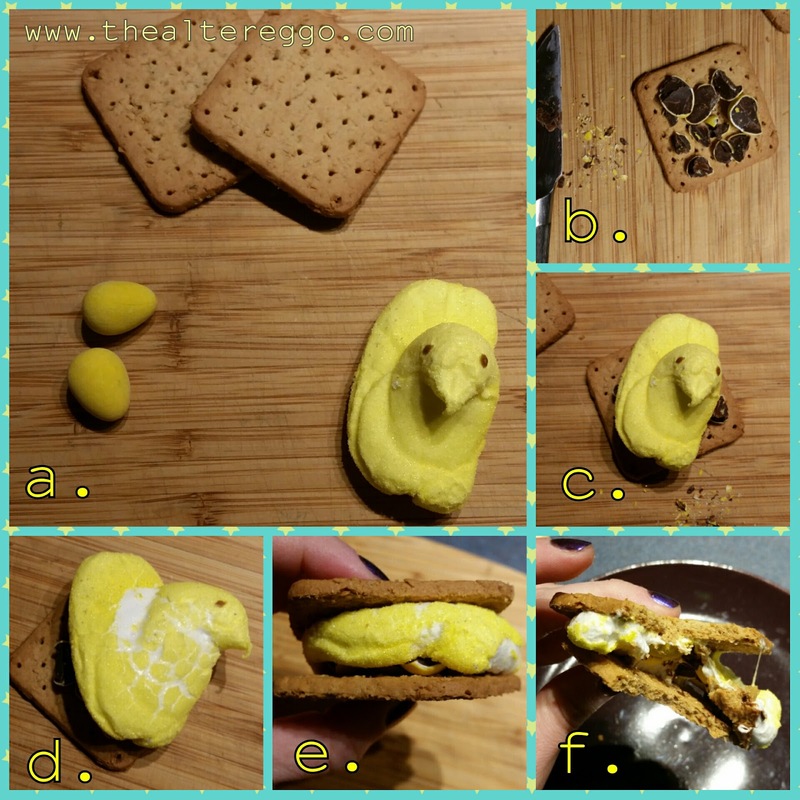 Figure 2 visually documents the procedure for making Peep S'mores. c. Gingerly place your Peep on top of the Mini Egg bits. Transfer this assemblage to a microwave-safe plate (not visualized). d. Microwave your assemblage for 10 seconds (not visualized). Watch your Peep carefully! You don't want your peep to explode like in this video, or maybe you do, I don't know. You do you. I digress. After about 10 seconds the Peep will be nice and soft and warm (see Figure 2d). e. Smoosh your second graham cracker on top of the assemblage. This will also help get the warm Peep in contact with the melting Mini Egg! f. Take a bite of ooey-gooey-melty goodness! Experimental Notes: As mentioned, Mini Eggs are hard to cut in half, but it ended up being a non-issue. I was going to microwave the Peep for 15 seconds, but started to see mass expansion after 10 seconds, so promptly stopped microwave. This version is gluten-free! Final Thoughts: I still have more Peeps, Mini Eggs and graham crackers. I'm making more Peep S'mores! The Elasticity of Peeps Under Easter Stress Situations?